In the very clever stop frame animation “Animated Tower,” the facade of a building at the University of Health Sciences (HESAV) in Switzerland was converted into an analog 10 x 11 display, with each window serving as a pixel. 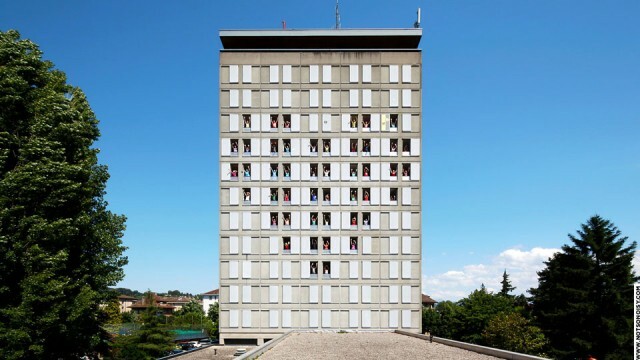 Students, staff, and friends of the university operated each of the 110 windows, opening and closing the windows and shutters to form moving patterns on the facade. A making-of video at the end of the animation shows how they did it. The animation was created by Swiss artist Guillaume Reymond (aka NOTsoNOISY) and Trivial Mass Production, also of Switzerland, to celebrate the 10th anniversary of HESAV.